KUALA LUMPUR: Goldis Bhd is confident of a good response for its soon-to-be-completed GTower and is in the final stages of negotiation with anchor tenants to take up space in the Grade A++ office building. 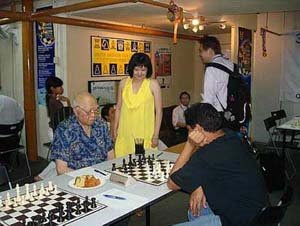 GOLDIS Berhad chief executive officer Tan Lei Cheng dropped in at the chess league just in time to watch her chess-playing father Dato Tan Chin Nam start off his game. Executive chairman and chief executive officer Tan Lei Cheng said the anchors comprised companies in the oil and gas and information technology sectors as well as multinationals. “It will take time but we are confident that GTower will be fully taken up. There are not many new stock in terms of offices in the city centre and most of the existing ones are quite old. “Currently 40% of the total space has been taken up already,” she said after the group’s AGM yesterday. GTower, which started construction in July 2006, is expected to be completed and operational in the fourth quarter. The 30-storey twin tower GTower has over 500,000 sq ft of office space and CEO duplex offices available for lease. The G City Club Hotel, within GTower, is a boutique five-star hotel comprising 180 rooms. Goldis has private equity investments in the country and China with focus areas in healthcare, property investment and development, information and communication technology, paper manufacturing, water treatment services and organic aquaculture. Tan said the group recently signed a build, operate and transfer concession agreement and supplemental agreement via wholly-owned subsidiary Crest Spring (Shanghai) Co Ltd of a sewage treatment plant in Zou Cheng Industrial Park, Shandong Province in China. “We are at the design stage now. It will take 1½ years for the plant to be ready. It fits into our investment strategy and is a long-term cash cow business. 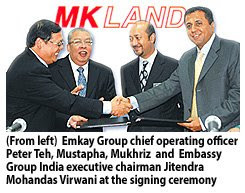 “With our experience we can also look at the sewage treatment business in Malaysia in future,” Tan said. The group already operates two sewage treatment plants in China. On new investments, Tan said Goldis had no plans to invest in new businesses at the moment but would focus on growing its subsidiaries via mergers and acquisitions or organically. Goldis’ private equity investments include Hoe Pharmaceuticals Sdn Bhd, Macro Kiosk Bhd and Protech Yu (Asia) Sdn Bhd. Goldis recorded a 5% drop in net profit to RM8.2mil for the first quarter ended April 30 versus the previous corresponding period while revenue slipped 7.5% to RM43mil. All resolutions were passed at the AGM and EGM yesterday. PETALING JAYA: Property developer Glomac Bhd’s net profit rose 66% to RM7.21mil in the last quarter ended April 30, as revenue rose 39% to RM99.89mil compared with the previous corresponding period. This brings its full-year (FY09) net income to RM32.3mil, which was slightly lower than RM35.1mil achieved in FY08. Sales grew to RM352mil from RM324mil previously. In a press release issued yesterday, Glomac attributed its improved performance for the year just ended to strong progress billings from on-going projects, with maiden contribution from new developments. “Group profits for the year include RM4.4mil fair-value gain for the sale of Wisma Glomac 3,’’ it said, adding that minority interest was higher for the year due to higher contribution from 51%-owned Glomac Tower. This was the primary reason from the decline in net profit despite higher revenue achieved for the year. Glomac proposed a final gross dividend payout of 3.5 sen for FY09. “Prospects in the current year remain healthy, driven by unbilled sales and new commercial launches,’’ group executive chairman Tan Sri FD Mansor said in the statement. Total unbilled sales reached RM364mil as at end-April.